Having a new baby is a whirlwind. I can’t believe Evangeline is 6 months old next week. She has developed and changed SO much since she was born. I remember her floppy newborn stage, where I ALWAYS had to have her head supported, and I couldn’t even imagine the day where she’d be able to hold it up. And her first semi-smile literally lit up my day, and now she cannot stop smiling, and has begun belly laughing (is there anything better in the world than hearing a baby laugh?). Babies grow, change and develop so quickly, and I am learning how important it is to be prepared for every stage. Because I am a busy bee (starting a new business, continuing with my old business, and trying to keep up with social media and my blog), and Evangeline is constantly on the go. I’m realizing as she is getting bigger that I need to make sure that we have some intentional “play” time, where she is able to explore, attempt to grab toys, and develop motor skills. I was really excited when VTech approached me about trying the Stroll & Discover Activity Walker. This interactive walker grows with your child. Starting from Evangeline sitting between my legs pressing all the buttons on the activity play panel, to her eventually being able to sit on her own and press the five light up piano keys which introduce colours and numbers, or she can grab the cell phone which develops her motor skills. She can also meet six friendly animals by inserting the three shape sorter pieces. An educational, fun toy is exactly what I was wanting for Evangeline. It’s interactive, and it’s teaching her everything from numbers, colours, animal names and noises, shapes, and unique voices and sounds. The best part is, when Evangeline is ready ,she can use it as an adjustable two-speed walker. 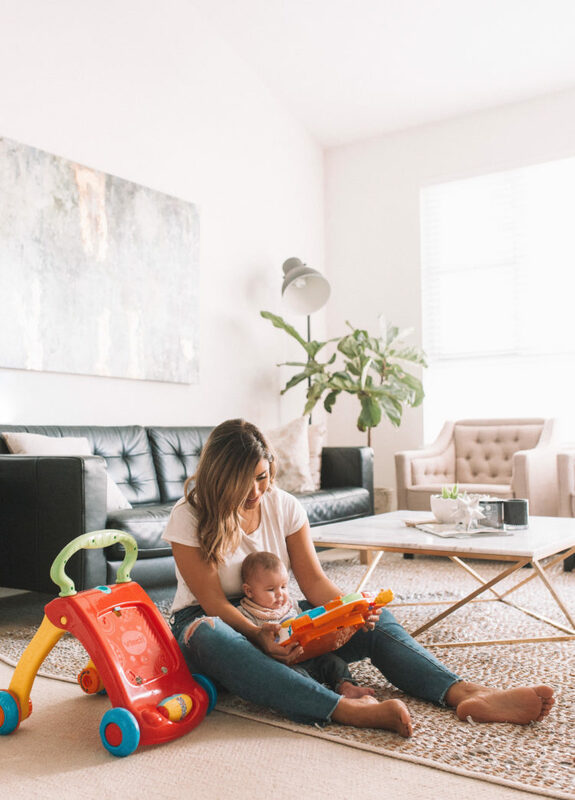 There are many toys and “must-have” baby products on the market, but it is so important to do your research and find something that will grow with your child. The Stroll & Discover Activity Walker is intended for ages 9-36 months (although Evangeline uses it all the time at 6 months old). This makes for an awesome (and practical) baby shower gift, or first birthday gift! Visit the VTech website here to discover where you can purchase the Stroll & Discover Activity Walker. If you do try it, I’d love to hear what you think!